In 2009, Warner Bros. Interactive Entertainment did the impossible: published a Batman game that was actually good. The success of Batman: Arkham Asylum spawned a series, and this year gamers will be treated to two titles featuring the Dark Knight. 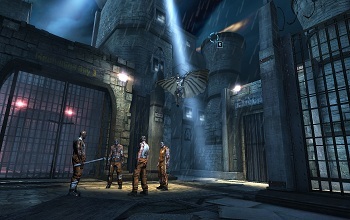 In addition to Arkham Origins, Warner Bros. is publishing Batman: Arkham Origins Blackgate, developed by Armature Studio. Even without the graphical prowess of its console counterparts, Blackgate is shaping up to be another entertaining entry in the franchise. If you've played a game in the Arkham series before, some elements of Blackgate will be instantly familiar. Combat is almost identical: a tight melee system of attacks, counters, sneaky moves, and take-downs from above. The way Batman approaches any fighting situation depends on the villains; unarmed henchman can be taken down in straight combat, while those equipped with guns will require a more tactical approach. Where the gameplay deviates from the core series is the exploration. In the section I played, which was meant to serve as a tutorial, Batman's path was very straightforward, a far cry from the open worlds of Arkham City and Arkham Origins. Chasing down Catwoman, Batman ran, crouched, and grappled his way across a 2.5D city. Detective Mode is easily activated by tapping the 3DS touch screen and using the thumbpad to move it around the environment, which was occasionally necessary to reveal enemy placement or a path forward. The simplicity and linearity of the first level had me a bit concerned about Blackgate; Batman's familiar tools were there, the combat felt seamless, but following a taunting Catwoman through a straightforward path took some of the joy out of being the Dark Knight. Being that it was meant to serve as an introduction to the game, though, it's not hard to overlook that, and I'm hoping later levels have more depth. Where Blackgate adopts a distinct identity is in the cutscenes, which use a motion comic-like approach. Given Batman's roots in comic books, this style suits the franchise well. Trying to emulate the console games' cutscenes would have just shown the 3DS and Vita's limitations, so instead the developers found an aesthetically pleasing way to convey important story moments. Despite being on a much smaller screen, Batman: Arkham Origins Blackgate feels very much like the console games in the series. The combat in particular was a highlight of this demo; pulling off a series of well-executed melee moves and blocks is very satisfying. I'm optimistic about playing the rest of the game when it launches later this month. Batman: Arkham Origins Blackgate will be out for the 3DS and Vita on October 25.